I had a chance to catch up on some stuff this weekend and came across an interview with Mike Babcock on Jason Gregor's show this past week as well as the great DraftCentre podcast with Craig Button. Views his job as a "teacher" and maximizing the potential of athletes. Coaching is a "solution business" where you have to bring new ideas every day in order to maximize the potential of the group. Some of his biggest influences were opposing coaches. Perry Pearn from his days in the ACAC, Billy Moores from his CIS stint, and Don Hay in the WHL. Other great coaches gave him fuel to beat them, and he wanted to discover what made their teams so great. R&D in coaching - not research and development, but robbing and doing. Talked about how he doesn't have many original ideas (obviously he's being modest), but he is always seeing what he can steal from other coaches and adding it to his repertoire with good execution. From what I gathered on my own, he loves buzzwords. He talks about "managing" and dealing with "people" - humanizing environments and using coded language to connect and interact with players on a personal level to get the best out of them. Ralph Krueger is also great with this, maybe even better, from what I've seen in Oil Change and interviews in general. Further on the communication front, he said the shortest meetings can have the best information. He learned this from interacting with Jacques Lemaire on the 2010 Olympic staff. Says he loves picking up "perils of wisdom" from other coaches like Lindy Ruff and Lemaire when he gets the opportunity to work with them. Comparing the WHL and major junior as the closest thing to the NHL structurally. Called it "NHL-lite." He said the AHL is more comparable to college hockey where you have the week to prepare and games on the weekend. Biggest jump for players is from major junior to American League, adjusting to the speed of the game. Biggest jump for him was from ACAC to major junior. Briefly talked about the philosophy of being "overripe" in Detroit in regards to their developmental model. The biggest challenges of managing a bench: 1) Accountability 2) Different people play better on different nights, important to ride with who is playing well 3) Controlling and exploiting matchups. Touched on his "lifelong learning" philosophy taken from Scotty Bowman. If you're not getting better everyday, you're not going to have a job. What works in the ACAC wouldn't work in major junior, what works in major junior won't work in CIS, what works at World Juniors wouldn't work at the World Championships, and so on and so forth. He stressed the importance of being flexible and constantly reinventing yourself and being open to new things. You can take bits and pieces from your experiences but it is paramount to constantly reinvent yourself and try to be ahead of the curve. It's "mandatory to be cutting edge," he says. Stressed his desire for "ultracompetitive people" and "everydayers." Simply said to find somewhere else to play if you're not those things. I find Mike Babcock to be such a fascinating guy. The pure intensity and focus he brings even in interviews is both frightening and inspiring. Probably my favorite part about him is how he stresses he is always learning, willing to try new things, and incorporating new ideas to make himself and the team better. Lots of old school coaches are set in their "ways" and systems, and inflexible to evolving landscapes. Recognizing that need for constant improvement and innovation, and parking his ego at the door, is part of what I think makes him such a great coach. 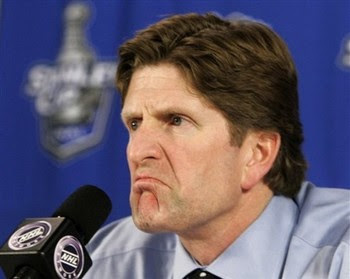 Pretty unrelated, but I should also mention I admire Mike Babcock's "style" on the bench. His suits, shirts, and ties are pretty subtle, but always well-fitting. He loves the spread collar and full windsor knot. I imagine him giving the most inspirational speech possible to his tailor to get that great fit. Since TSN has an awful media player (if you can even call it that), you'll have to click the link here to hear the first of two podcasts. You'll want to skip to around the 18 minute mark for the stuff I'm going to discuss. I'm always interested in what Craig Button has to say — his lists on TSN are often a departure from "conventional" wisdom that is found on ISS and Central Scouting lists. When you read prospect forums and blogs online, Button is often decried as a joke and seeking attention for his divergent views, but I really believe they are much closer to what an NHL team's list may look like, especially given his background. I sometimes find people can get caught up a little too much in convention and familiarity and take other rankings a little too seriously. Groupthink and confirmation bias, and all that. In the podcast, Button discusses his time in scouting and player personnel and brings up a bunch of interesting tidbits. Around the 18 minute mark he starts talking about Jordan Subban (who is sounding like a great prospect and had a great showing in the Top Prospects game, I thought) and goes into size concerns and prospects in general. He talks about how he feels it's more important to rank players in groups rather than getting caught up in their numbered rank because sometimes the differences can be so minuscule and drafting is such an inexact science. The game is fast. Jarmo Kekalainen has also talked about this point before, which I detailed in an earlier post. Players have to be able to "think" and decipher information lightning quick. Players that do that, you'll feel the most confident about in their ability to translate to the next level. Players with great skill, but maybe not the greatest ability to think the game, are limited in their ability to become "elite." They can still be players in the league but they will rarely reach that higher level. In viewing size as an issue, if a player (like Jordan Subban) doesn't see get trapped in spots or rarely finds themselves in positions where their size inhibits them at a junior level, he won't see size as an issue. It's important not to discriminate against prospects because of their size. There was more but those were the most interesting tidbits for me. The second podcast I listened to included an interview with Jarmo Kekalainen (who I've expressed my admiration for numerous times) and it included a number of interesting points. It's always very enlightening to hear what successful people in the industry have to say in their reflections. The interview starts at the 45 minute mark. Once again, TSN has a terrible player with basically zero "sharing options," let alone embedding, so you'll have to click this link to hear it. 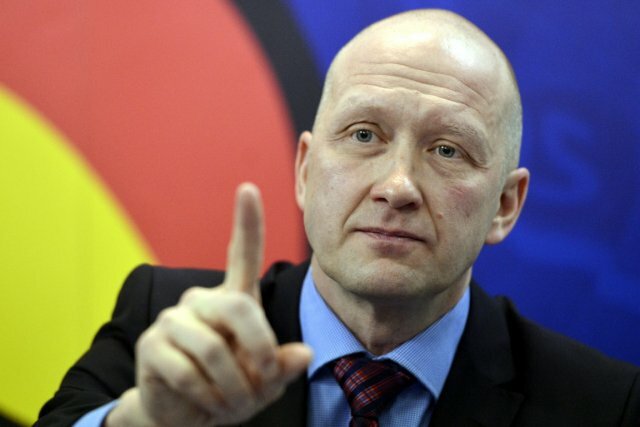 Jarmo talks about how he wants the same passion in the first round and seventh round from scouts. He wants his scouts to be fighting and as excited for "their guys" at the end of the draft just like the beginning. He wants conviction and passion, and at the end of the day it's a question of "yes or no" in drafting a player. Scouts should be very certain and approach every pick the same way. Sami Salo was drafted off of the passion of Jarmo. In his first draft with the Senators, Pierre Gauthier came up to him and said "pick who you want." The qualities that stood out in Salo, a lanky defenseman, were his good stick and shot, along with the size. With three first-rounders in Columbus, the whole organization has to be onboard. It presents a great opportunity to build the future, and also represents a way for the scouting staff to demonstrate their ability as well. It should be obvious, but I found it interesting he is using it as an evaluation tool for player personnel staff. Talks a bit about developmental models and refers to Pietrangelo not coming into the league full-time until 20. Button discusses the zeal for inserting top picks into the lineup too early by many teams. Jarmo states it is management's responsibility to put players in position to succeed, and they must be very careful in with the developmental process. Evaluation isn't just at the draft, it is continuous even post-draft with your own players and you need to be hands on. You need to be sure when the time is right to advance a player is and that is the only way to develop player, in his opinion. He also adds it is not always easy to predict performance, the unpredictability factor is very prevalent in the industry. Discussed Marshall Johnston and Rick Dudley in Ottawa as major scouting influences. He stressed the importance of keeping eyes and ears open for guys with experience. It might sound simple, but one of the most important lessons he learned from Johnston was stressing going to game and watching the game, not chatting with buddies and eating a hotdog and drinking a Diet Coke. "Go to the corner, watch the game, focus on the game, and concentrate. Try to get below the surface." Once again, probably one of the most interesting points of the interview points again to hockey sense. He says the obvious is the skill and skating, everybody can see it. You have to find the hockey sense, you have to find the instincts, and you have to study the character of the prospect. Johnston taught him that and how to be very thorough in analysis, along with the importance of organization and preparation. The best education he received was following what Johnston was doing. He talks a bit about Sasha Barkov and Finnish hockey, but I wanted to focus more on the processes involved in scouting. I highly encourage listening to the entire interview.